A view of Boston's North Union Station on Causeway Street, 1895, via Detroit Publishing Company Photograph Collection, via Wikimedia Commons. 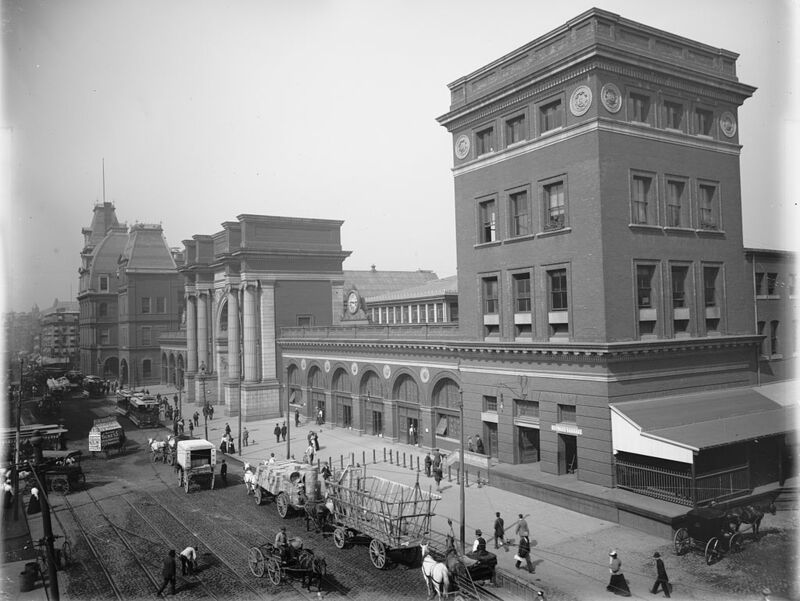 Any discussion on “Lost Boston” has to include Boston’s North Union Station, which once stood on Causeway Street, on the current site of the TD Garden (better known locally as “the Boston Garden” and by some as the “Fleet Center”). 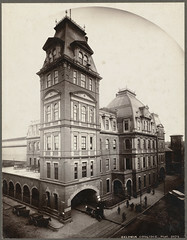 North Union Station, which consolidated the operations of four different railroads into one building, was completed in 1893 and demolished in 1928. Traffic through Boston’s North Union Station came mostly from Boston’s north and northeastern suburbs, although some traffic also originated from central and western Massachusetts, and even further afield from places like Maine, the White Mountains of New Hampshire, Vermont, and Canada. Soon after it opened, the Boston Sunday Globe stated that a number of people equal to the then-population of the United States (62.6 million) passed through its entrance once in every two years. North Union Station, actually three adjoined buildings, was completed in 1893 and included the former Boston & Lowell Station, which dated from 1873 and was known as just ‘Lowell Station’ to the locals. Lowell Station, the left-most building in the photograph above (almost lost in the haze), had over 200 feet of frontage on Causeway Street and was 700 feet long. Built by General Stark, it replaced an even earlier station, the first on the location, which dated from 1857. The Lowell Station housed the head offices of the railroad and boasted some of the largest and most accommodating waiting rooms in the country. Opened in December 1873, the Lowell Station quickly became known, simultaneously, as one of the finest stations in the country, and as “Stark’s Folly”; many Bostonians thought it too grand and expensive for Boston’s needs. Even after its absorption into the larger North Union Station, Lowell Station remained somewhat distinct, retaining its own waiting rooms and toilets. The station also housed the inward baggage room. On the other end of North Union Station was the “office tower” (the right-most and closest building in the photograph above). The top two stories of the structure served mostly as offices. Its ground floor contained the outward baggage room and space that had been leased to the express companies. The Causeway Street frontage of the building included a 45-foot tower; the reminder of the building measured over 300 feet in length. The Causeway Street facade of the entirety of North Union Station spanned 586 feet and boasted as its main entrance an archway of cut granite some 80 feet wide and 70 feet high. Upon entering North Union Station through the arch, one would find the main waiting area, some 98 feet square, and filled with benches (or settees, as they were called) that could accommodate several hundred people. The men’s and women’s lavatories were provided on each end of the waiting area. Each boasted Italian marble, the latest innovations in plumbing, and were quite spacious – they could accommodate nearly 100 people. To the right of the waiting room was the parcel room, where up to 1000 pieces of luggage could be checked at once. To the left stood the ticket office, an elaborate system of sorting, processing and selling railroad tickets for the B&M railroad as well as other railroad companies. The ticketing system was so large and complex that it took 18 men to run it in 1894. North Union Station, Boston, 1895, via Detroit Publishing Company Photograph Collection, via Wikimedia Commons. The scene outside Boston’s North Union Station wasn’t entirely unlike today’s. Foot traffic and vehicle traffic clogged Causeway Street and pedestrians needed to take care crossing the street to catch their train or meet their friends arriving from points north and west of the city. 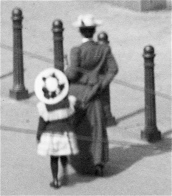 The scene above, from the Detroit Publishing Company’s photograph collection, dates from 1895. To arrive to, or depart from, North Union Station most relied on public transportation, i.e., electric cars, if they lived beyond a comfortable walking distance. The station’s hack stand was designed so that its waiting area was under the station’s roof, to protect waiting travelers from the elements, a luxury that was much appreciated by Boston’s masses. North Union Station - Gentleman arriving, 1895, via Detroit Publishing Company Photograph Collection, via Wikimedia Commons. Like today, people rushed to and from Boston’s North Union Station. The station’s train shed was said to be the largest in the world, covering nearly 6 acres and boasting over 20 tracks. Union Station, Boston - 1895, via Detroit Publishing Company Photograph Collection, via Wikimedia Commons. Below, passengers disembark from an electric car outside Boston’s North Union Station. The station had an extensive newsstand just inside the main entrance to the left, as well as its own barber shop and restaurant. Boston's Union Station - Arrivals, via Detroit Publishing Company Photograph Collection, via Wikimedia Commons. Boston's Union Station - Arrivals , via Detroit Publishing Company Photograph Collection, via Wikimedia Commons. In the end, Boston’s North Union Station stood only for a few decades before it was demolished and replaced with the Boston Garden (and a new North Station) in 1928. The Boston Garden, itself demolished in 1997, and replaced by the TD Garden, saw many celebrities perform under its roof, including The Beatles (1964), James Brown (1968), the Rolling Stones and the Grateful Dead (multiple times). The Garden also saw many championship seasons from the Boston Celtics and Boston Bruins. Today, the TD Garden stands at the site, with yet another North Station underneath. Even in its day, the North Union Station had its detractors, who claimed the building’s beauty was too extravagant and came at too great a price. Others claimed its incorporation of three very different buildings was incongruous, and well, just plain ugly. Seen today, more than 80 years after its demolition, North Union Station is seen in a much kinder light. It becomes a part of the lore of “Lost Boston” and elicits a certain sense of nostalgia for a part of Boston that no longer exists.